Priest James <+> [MU Online Fanz] <+> Official 3rd-party [MU Online] Fan Site & Game Guide! [Priest James] owns an item shop with various mastery tier items for sale like equipment, skill items, and crafting ingredients. [Priest James] item shop only accepts [Ruud] for purchases. The only equipment available in the item shop will fit the character's class. [Ruud] is a currency, like [Zen], which can be earned from opening any [Mastery Box]. [Mastery Box] can be obtained based on the amount of [Contribution Points] earned while playing mini-games with a [Master Level] character. [Ruud] is [Bound] and stored in the [Equipment Inventory]. [Ruud] is earned from opening any [Mastery Box]. 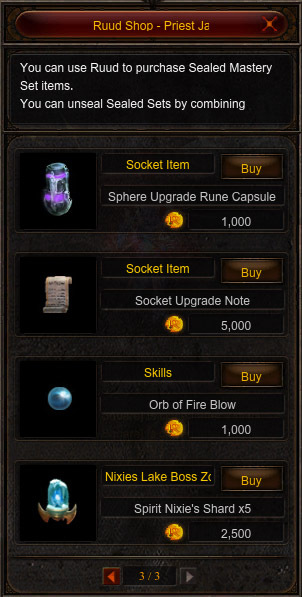 [Ruud] can be earned from special [WEBZEN] promotions.